Should have seen it coming really. For this long stay in New York City–20 days cat-sitting in Brooklyn–I vowed to buy only one book per bookstore visit. And to visit no more than one bookstore a day. The buy one book was to be a requirement which, while it might force me to buy books, would have resulted in fewer books purchased overall than usual. But I failed right off the bat. On the way back to the apartment after visiting the Brooklyn Museum we stopped in at Unnameable Books on Vanderbuilt Avenue which is just a ten-minute walk from the museum. It’s a great little shop. Not what I would call a destination bookstore like The Strand or McNally Jackson, but an excellent neighborhood new and used bookshop with lots of titles I never heard of before that I had to have. The Dead Mountaineer’s Inn by Boris and Arkady Strugatsky is a mystery by the Russian brothers best known for their science fiction published by Melville House Books. I’ve been a fan of Melville House Books since their Art of the Novella series started coming out several years ago. This is a Neversink edition. The Neversink editions feature rare titles that have all been very good so far, at least the ones I have read. And they have cool cover art like all Melville House Books do. 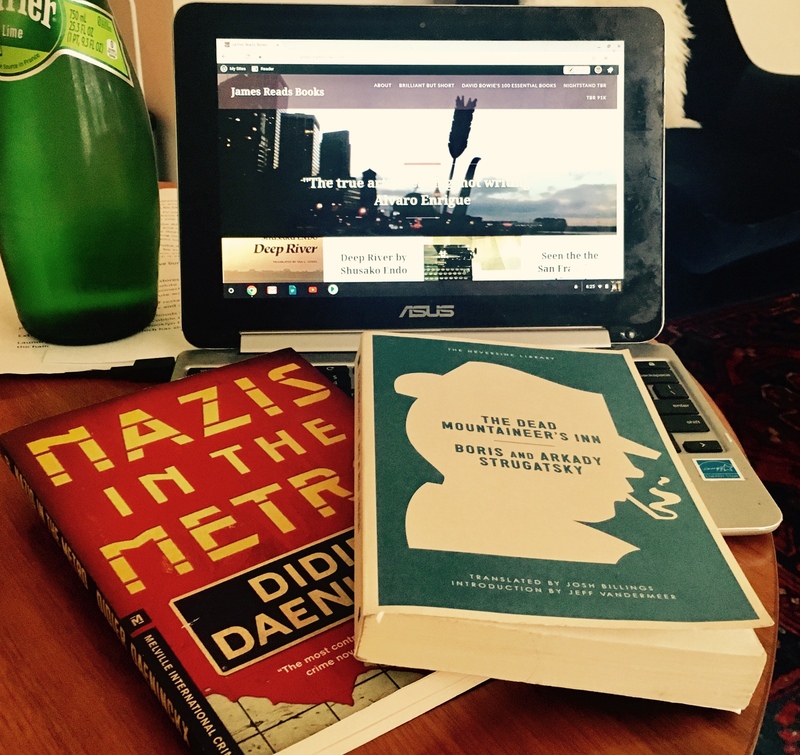 The second is a mystery thriller by French author Didier Daeninckx called Nazis in the Metro. Normally I wouldn’t buy a book with the word Nazi in big print on the cover. There’s no rational reason for this, really, I just don’t want to see it when I pick up a book. But I read a thriller by Mr. Daeninckx a few years ago, published by Melville House as I reacall, and loved it. So, I got this one, too. Breaking my pledge to buy one book per bookstore right out of the gate, day one. In my defense, the used price was quite good. As a mortification, I’m going to start a running list of New York books. If you like, you can guess just how many books I’ll end up buying during my 20 day stay in a comment. Maybe I’ll send the winner their choice of the books I end up buying. After I’ve read it, of course. love the challenge!!! And what a great way to do New York!!!! are you eating good – not just well????? ps – landlord is uping their game – more walk throughs, more visits. Might be gone from 21 Brompton by September!!!!! Yikes! There’s always a Victorian bedroom available at our place in Vallejo if you need it. My guess is 20. And that will take a lot of effort (to keep it to one a day). I will guess 30. But there’s NO judgment here… trips to special places require the bringing home of special books from those places. I am thinking 18 days times 1.5 = 27. I am laughing at your inability to abstain from buying books. None of us can do that, best laid plans and all. Enjoy the experience.